The Taumarunui Cycle Classic is a scenic 114 kilometre ride which loops around to the town of Ohura on fast smooth roads. Starting outside the Taumarunui War Memorial Hall heading north on State Highway 4 for 26km then turning left at the Ohura Road State Highway 4. You are then on undulating country roads. At the 63km mark you reach Ohura township, transition for the relay and single leg. About 10kms south of Ohura is the Tatu turnoff left onto River Road where there is a sign pointing to Taumarunui. There are a few hills to tackle in this final section. The largest (a 3km category3) summits at Nevins Lookout. The final descent leads you to the edge of Taumarunui, turn right at the roundabout and you’ll be heading down the main street for a further 1km, turning right onto Turaki Street and finishing outside the Athletic Sports Centre. 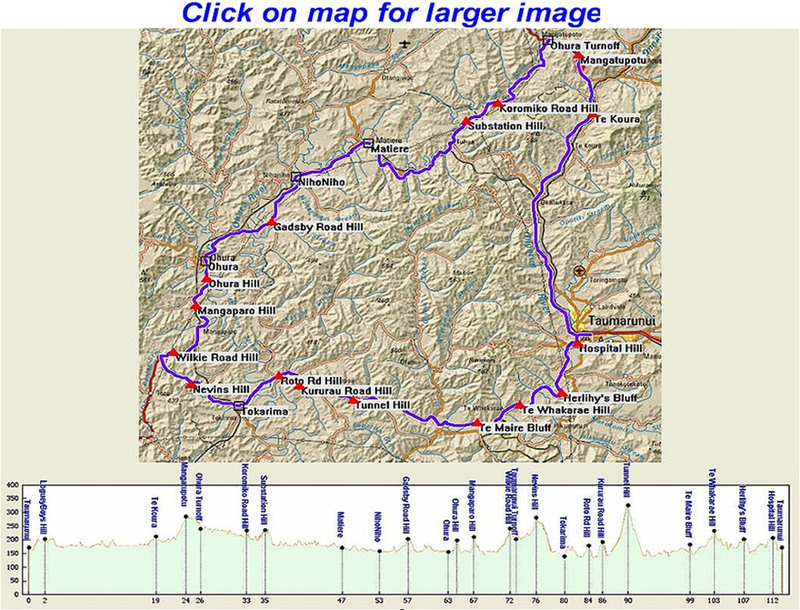 Stage One is from Taumarunui to the Ohura Cosmopolitan Club, and Stage Two (second rider) is from Ohura to Taumarunui (shorter distance but more hills).